On Thursday December 15. 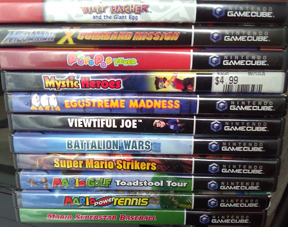 2011 Gamestop had a special holiday sale for Power Up Rewards members – 50% off Gamecube games. This sale was just one of the daily specials they have going on this holiday season. I was probably one of the few to be excited about this promotion as it was my chance to fill the gaming gaps missing from my GC library. On this day I visited 5 local GS’s and cherry picked the shelves. Given the fact that Wii U will be launching in 2012 without GC backward compatibility, GS is smart to try and move some of their backstock before the interest in Nintendo’s purple lunchbox completely disappears. Besides the 50% sale, GS also recently dropped the price on all used GC games making most used prices event lower. Further, many games that I purchased had two prices – a standard used priced, and an even lower price for Power Up Rewards members. Finally, I was not charged sales tax and Power Up Reward Member get another 10% these already reduced prices. Needless to say, I scored some sweet deals (at least in my eyes). GRAND TOTAL = $30.05 for these 10 games. I am also a completionist, meaning I will only buy used games if they come with the original case and instructions. Only on very rare occasions will I purchase a game in the generic Gamestop box. To my luck, 3 of the 5 Nintendo published games I purchased still had the Club Nintendo serial code for me to register to my Club Nintendo account. Granted, these old games are not eligible for “coins,” but they were added my queue nonetheless. If you noticed, I put Billy Hatcher and Chibi-Robo in parentheses. Well, there is a story behind these games – I found the case on the shelf but the GS employee could not find the game, leaving me disappointed. Luckily, the one store let me keep the Billy Hatcher case, but the other store where I found the Chibi-Robo case would not let me keep the case. Chibi-Robo also didn’t have the instructions but given this game’s limited distribution I figured I could make an exception. For the most part, I was quite pleased with my findings this day. It is kind of funny, by I managed to find my old save files from the Mario sports titles that I picked up; I rented them when the first came out years ago. Also, I was surprised to remember that PuyoPop Fever is only two-player when I thought it was up to four. It doesn’t really matter though because finding a single friend that wants to play Cube titles is going to be difficult enough. But for around a couple bucks per game, I figured I cannot go wrong even though most of these games will probably not be played more than once, if at all. There are now destined to sit on my shelf forever.